The World Economic Forum has identified water security as one of the most tangible and fastest-growing social, political and economic challenges faced today. It has also signaled that water is at the heart of a fast-unfolding environmental crisis, stating that in every sector, the demand for water is expected to increase and analysis suggests that the world will face a 40% global shortfall between forecast demand and available supply by 2030. HotHouse will explore these issues and more at its next event. Most of us take fresh water for granted. Water fuels our cities, our agriculture and all the planet’s ecosystems. Without it we would not exist. Australia is the world’s driest continent, and now as climate change becomes a present reality rather than a future proposition, the extremities of drought and flood are becoming more pronounced. 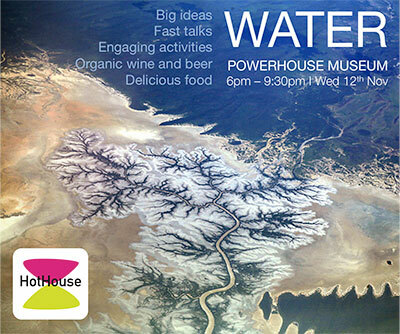 At the next HotHouse event, we’ll be exploring how we can work with water to reimagine our cities of the future – ensuring security of supply, resilience to a warming climate, and healthy liveable communities. Water infrastructure – Hidden networks of pipes mean that turning on a tap provides us with a seemingly unlimited flow of fresh water, which just as effortlessly disappears down a drain, out of sight and out of mind. As our cities grow, so too must this vast water infrastructure. How might the very plumbing of our urban environment change to deal with increasing water scarcity, scorching summer heat and high density living? Where does our fresh water come from? – As water scarcity increases, how can we continue to provide for our cities? Do we need more dams or more water recycling? Should we pipe it in from afar or collect it from roofs and mine it from sewers and storm water? What about desalination? It seems likely that in order to meet our growing needs we’re going to need a diverse range of sophisticated water sources. Relationship of water and energy – Ever thought about how clean fresh water, pumped conveniently to a tap near you, represents a remarkable investment of energy? At a time when we must reduce carbon emissions by any means possible, approaches that maximise energy efficiency in the water system are getting some serious consideration. Water-sensitive urban design – what if the water that goes down your sink waters the green wall on the side of your apartment block? Or when it rains, instead of rushing into storm drains and out to sea, that water could hydrate edible landscapes along your street or feed into artificial wetland habitats? As water-sensitive designs become more embedded and visible in the landscape of the places we live, perhaps our connection to water will grow and our communities will be healthier and more vibrant for it. Join a superb line-up of speakers to explore the future of urban water and how, with a bit of innovative thinking and good design, it can help to make all of our lives more enjoyable. Share your own ideas about how creative approaches to water might transform your neighbourhood or favourite place in the city. HotHouse is a quick-fire event series about creative solutions for positive change. Each quarterly event at Sydney’s Powerhouse Museum mixes superb speakers with audience participation to inspire and engage you on big topical issues. Meet like-minded folk, enjoy local organic food and drink and experience a relaxed, fun and utterly unique style of event. Book your tickets now – this event sells out! Brooklyn Sulaeman is the HotHouse Marketing and Events Manager.